Click Here to purchase a kit for your custom ride! (click pictures to enlarge and compare. 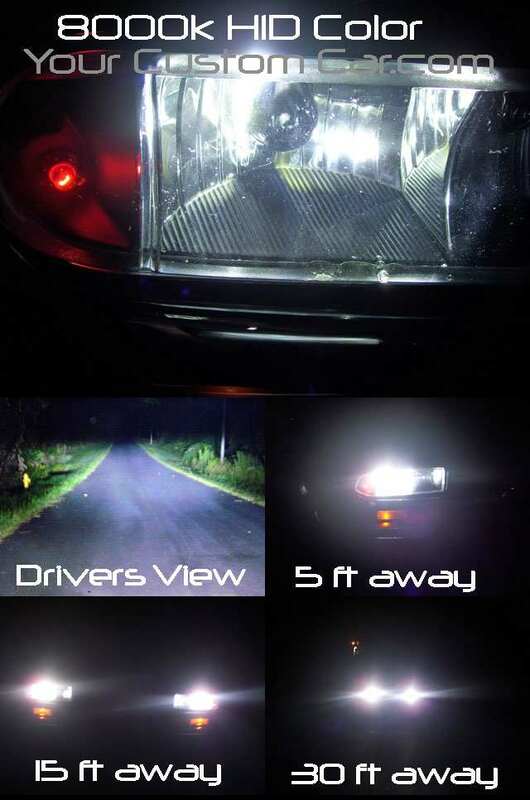 HID lights, (High Intensity Discharge lights) refer to lighting technology that relies on an electrical charge to ignite xenon gas in a sealed bulb. The light produced is similar to the light produced by the sun. 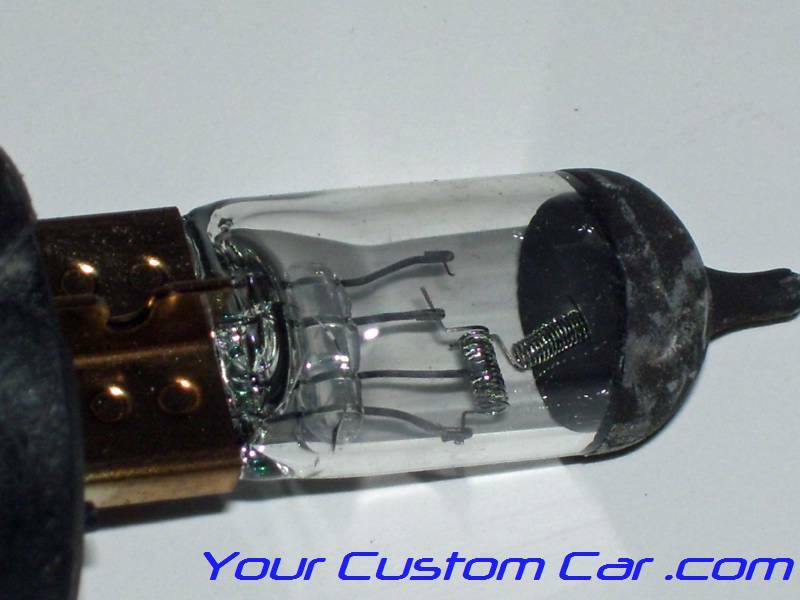 "HID's" do not have a filament but instead create light by igniting an electrical discharge between two electrodes in an airtight tiny quartz capsule filled with xenon gas. 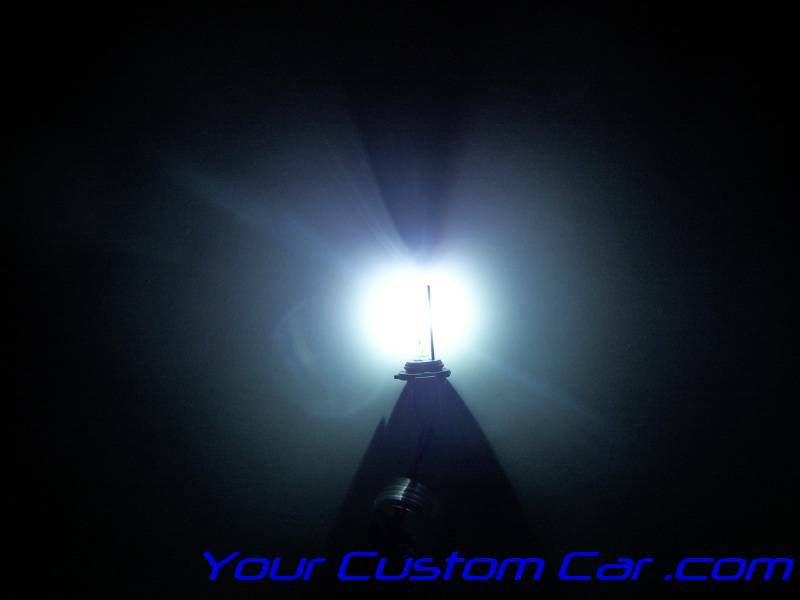 This is why this style of high-performance lighting is also called Xenon Lighting! 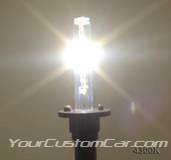 The HID xenon lamp works based on the on the gas discharge principle, where an arc of light is created between two electrodes in a glass tube filled with metal salts and inert gases. 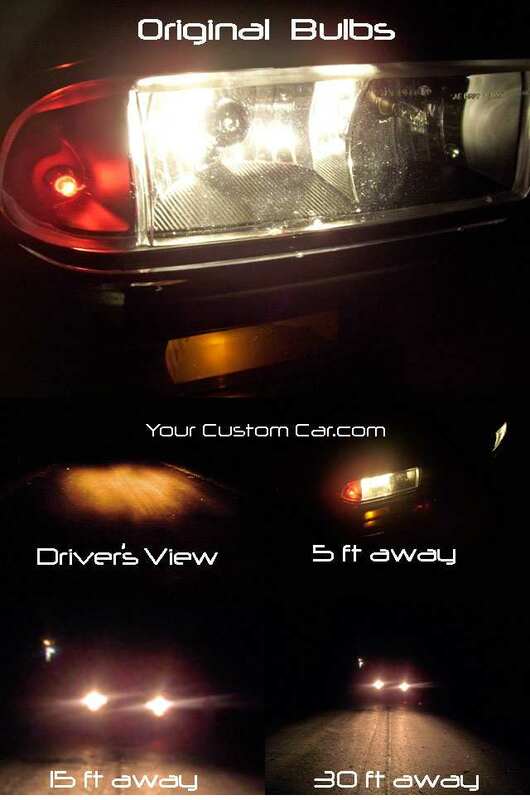 HID lighting produces more light and uses less energy than a standard bulb. The quality of light emitted by HIDs is closer to that of natural daylight, making them preferable for automotive applications. How does High Intensity Discharge lighting compare with incandescent (standard) lighting? In order to compare types of lighting, a basic understanding of how High Intensity Discharge lighting works is necessary. A standard incandescent light consists of a tungsten filament inside a gas-filled bulb . When the bulb is turned on, a current is sent through the filament creating a high current draw. 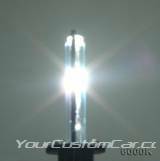 Tungsten has a high electrical resistance, so the current generates heat, which then produces light. The gas inside the bulb slows the evaporation of the tungsten filament, but eventually the heat will cause the filament to decay enough to break, causing the light bulb to literally “burn” out. Many light bulb manufactures claim that their incandescent "hyper white" bulbs will give you the HID look, but the truth is that these are still regular filament style bulbs with good marketing and poor performance! 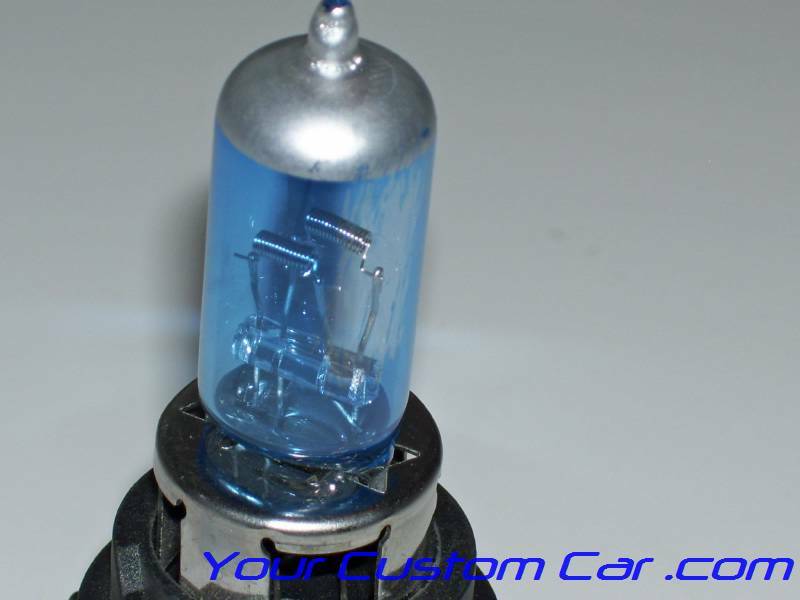 Most of the "HID look" light bulbs on the market are simply painted with a transparent blue paint that fades over time (see Pic), some are filled with some kind of "magic gas" that is supposed to give you true HID quality, but both are just gimmicks to trick you into buying their bulbs. Only true HID/Xenon lights, like we sell, will give you real HID lighting performance. HID's have a capsule of gas instead of the tungsten filament. The gas is actually used to produce light instead of simply slowing the decay of the bulb. Two electrodes are positioned close together and hermetically sealed inside the gas capsule. The electrodes are wired to ballast containing a circuit board with several high current capacitors, transistors, and resistors. The ballast acts as the light's control center, igniting the light and then regulating its power flow. When the ballast ignites, it takes in a small amount of power and creates an intense charge of electricity across the electrodes. This electrical charge excites the gas molecules inside the bulb and causes them to discharge photon particles, producing light. Because the light is based on this gas discharge, HID's only produce about 5% of their total output at ignition and can require up to 30 seconds to warm up to full power. This process creates several significant advantages over a standard light bulb. Because heat is not a necessary component of light production in HID lights, they are able to produce more light at a much cooler temperature. HID lights are also far more efficient because the electrical current is only the catalyst for the gas to discharge its light particles, not a burning filament. The ballast regulates a constant flow of power only to keep the gas molecules excited, while a standard light requires a constant intense electrical current to keep the filament hot. HID bulbs will last longer than standard bulbs, since there is no filament to burn out, and will continue to produce full light even toward the end of its "life." 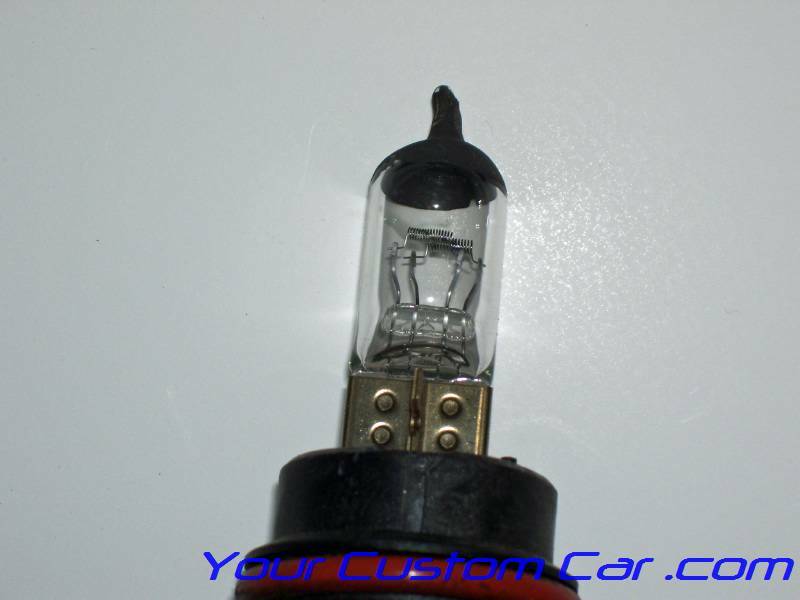 In addition to being more efficient, HIDs also produce a brighter and more intense light because the entire capsule of gas is used instead of just a small filament in the middle of the bulb. This also means that the light will be distributed more evenly than with a standard bulb. This advantage in light quality is a major reason why HID systems are preferable for automotive lights. 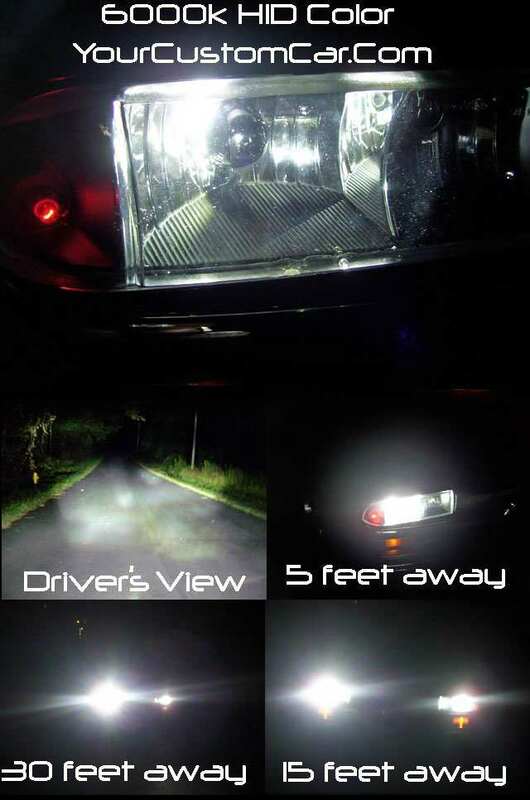 Motorists are able to see much more clearly and farther down the road with HID lights than with standard halogen headlights. In fact, many car manufacturers are including HID lights as part of their standard package instead of making them a luxury upgrade. 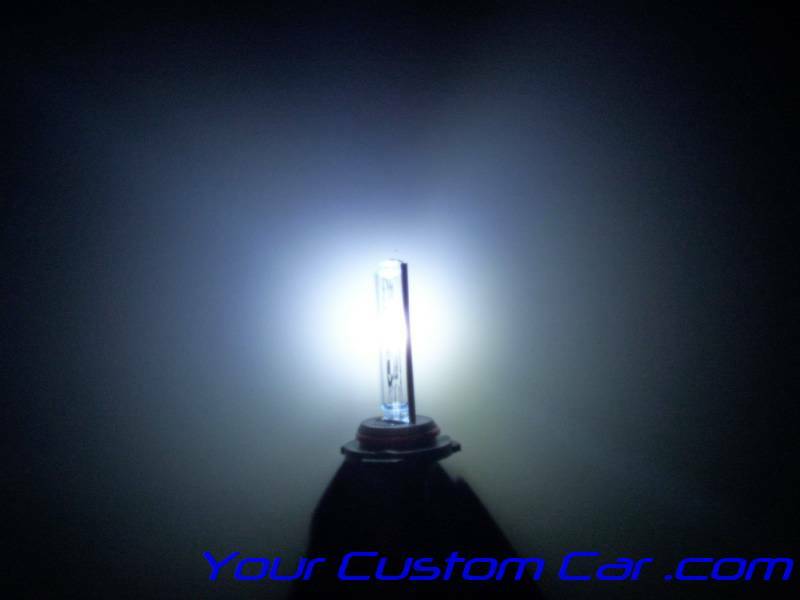 What other features make HID's better than regular light bulbs? 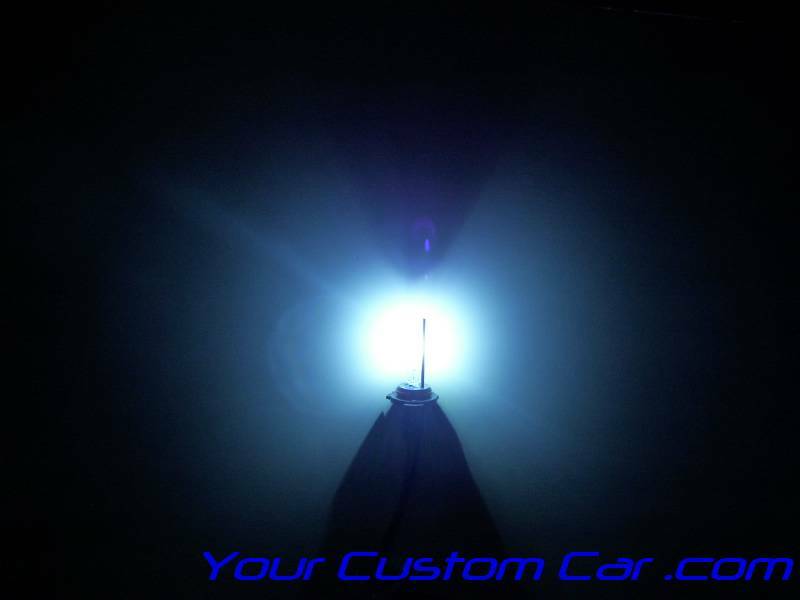 One of the most noticeable features of HID lighting is the colors of light produced. In HID lighting the color emitted by the bulb is measured using the Kelvin scale. This basically means that the color is varied due to its temperature. 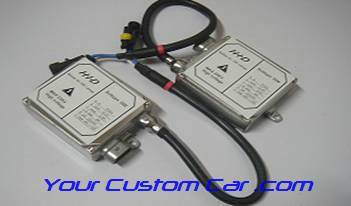 For instance, the HID kits we sell will range in color scale from 4300k (super bright white)-12000k (bright white with blue tint). 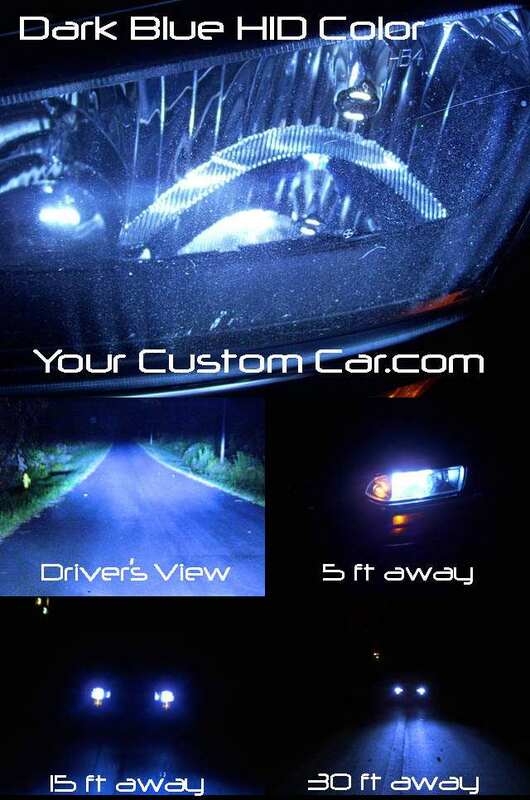 We also offer “Dark Blue” for those that want the “bluest” of headlights. Before deciding on the color you want you need to know what you are looking for first, Looks or Performance. If you are looking for performance, you should consider the 6000K version which will give you the most light output, however it will not display any blue tint. 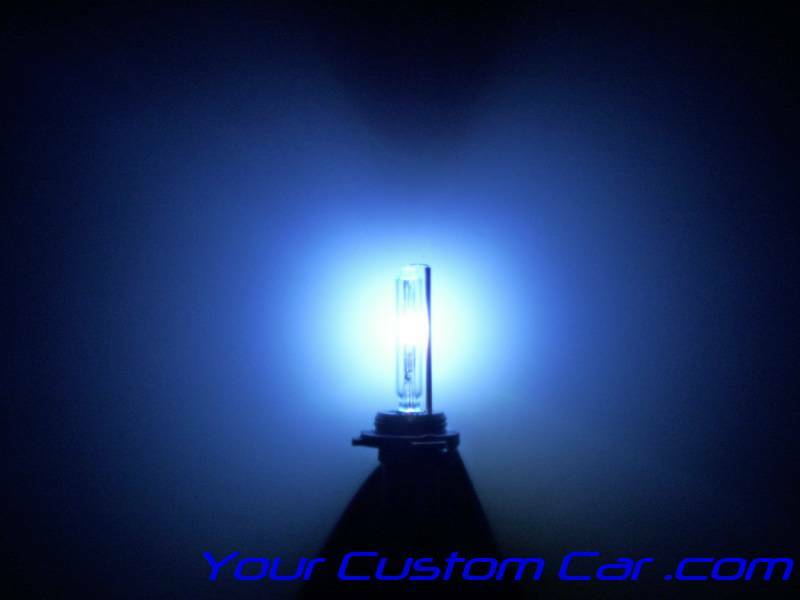 On the other hand, if you are looking for color, you need to get something between 8000K, and 12000K, or the ultimate in color, our “Dark Blue, or Purple.” However, you will not get as much light output with the intensely colored HID’s as you will with the 6000K. If you want the best mixture of light output and color you need to get the 8K which happens to be our best seller. 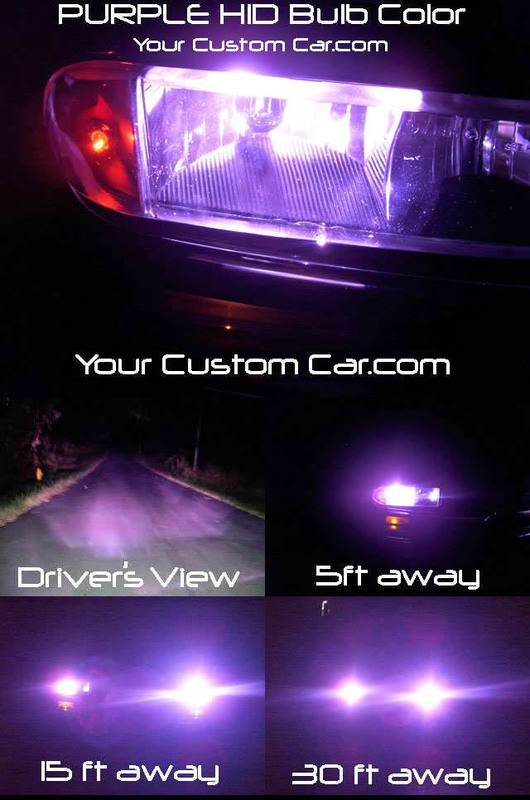 SEE OUR HID COLOR CHART BELOW! *You will find that the higher number "K" goes the more blue the HID lights get. 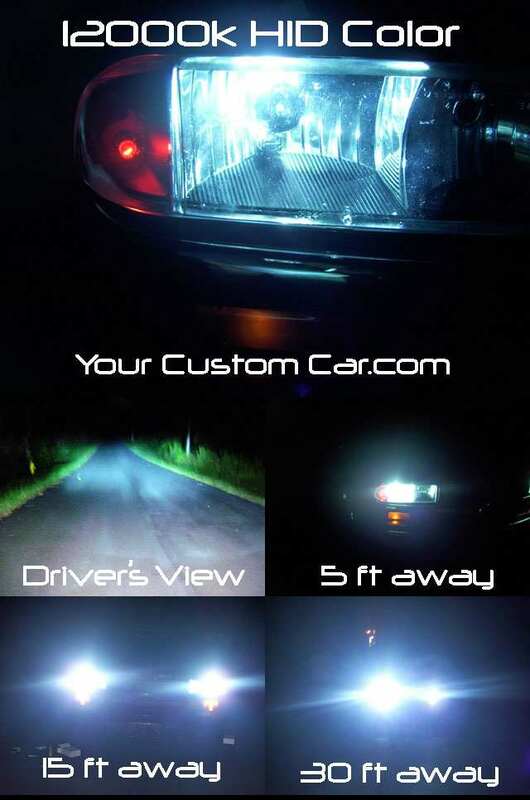 Click here to purchase an HID lights kit for your ride!